As part of a small interactive group - not an audience of dozens. (2) The first part of our NLP Practitioner Certification Programme. This means that you are learning in-depth NLP right from the beginning - and, even if this NLP course is just what you need right now, you can return and complete the Practitioner Certification programme at any time afterwards - even years later. 4 full days of NLP. Over 30 NLP tips, techniques and insights. Held four times a year. Pricing: Training fee £594. Accommodation for the 4 days £120. Prices include VAT. 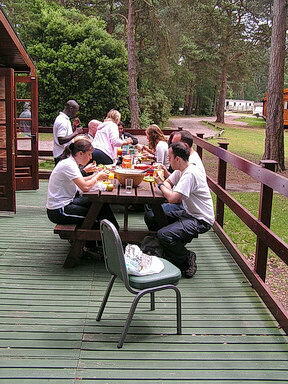 On-site accommodation for those who want a full personal development immersion and a nice break in the New Forest. Attendance limited to 16 people. Full money-back guarantee - you have two days to decide if the course is right for you - and if you're not convinced your fee is refunded in full. Monthly in-house newsletter of tips and techniques for everyone who has taken part in a Pegasus NLP course. NLP Core Skills (above) is the first part of our NLP Practitioner certification course. This means you can take later part in our NLP Practitioner Part programme 2 to bring your skills to the level of Certified NLP Practitioner. NLP Practitioner 2 is held each spring and every other autumn. It runs over two weeks separated by 4 weeks. Practitioner Certification Part 2 is open to everyone who has attended NLP Core Skills and attendance is limited to around 14 people. This advanced NLP course is open to Certified NLP Practitioners who have certified through Pegasus NLP. Attendance is limited to 12 people and the next Master Practitioner begins on 22 September 2018. The following programme runs September-November 2020. This advanced training programme is open to NLP Practitioners and to NLP Master Practitioners who have certified through a full-length, full-syllabus NLP training programme of 120 hours each. Held in the New Forest periodically. Attendance is limited to 10-12 people. Course dates: the next programme begins September 2019. Programmes are individually designed to suit the needs and culture of our organisational customers. Contact us via our contact form or call us on 01202 478 168. With our NLP Core Skills course you have a two-day money-back guarantee. If you are not convinced that the course will benefit you just let us know any time up to the end of the second day and we will refund your course fee – plus accommodation fee if you have stayed on site. And we will do this promptly, in full, and without question.